Shipping containers in Salt Lake City are used for a wide variety of purposes. 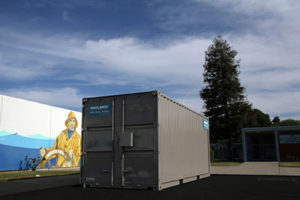 Mostly these affordable shipping containers for rent are used for additional storage when a business needs to remodel. You can see the Haulaway Storage Containers outside nearly every business that has construction happening inside the building. This is where that organization is keeping the items needed once the construction is completed as well as having a place to keep the materials needed during construction. Does this type of storage make sense for homeowners as well? The answer to that question is “yes.” Haulaway offers shipping containers in Salt Lake City for just about every need. They have shipping containers for rent in a variety of sizes from ten to forty feet to allow you to have the container needed in your driveway that will give you the added storage you want to have for the storing of your possessions from a room that needs to be renovated, or during a moving process. This gives you the flexibility you need as a homeowner to have the storage desired at your home to be able to complete any project you may have. These shipping containers for rent from Haulaway offer you the security you want and the protection you need for your items to be kept safe from the weather. All shipping containers in Salt Lake City from Haulaway are made of fourteen gauge steel with hardwood and steel floors. These containers are perfect for every project you have around the home and certainly are used for construction sites as well as at retail stores where they are used for overflow storage of products. Let Haulaway be the right choice for you when you need a storage container rental.